Selecting a UPS (Uninterruptable Power Supply) or battery backup for your computer shouldn't be a complex task. But it seems the simple tasks are rarely simple, and picking the perfect UPS to match your Mac or PC can be more difficult than you might expect. We'll help you sort things out. A UPS is an important aspect of safe computing. Just like backups protect the information stored on your computer, a UPS protects the computer hardware from events, such as power outages and surges, which can cause damage. A UPS can also allow your computer to continue to operate, even when the power goes out. In this guide, we're going to take a look at how to pick the right size UPS for your Mac or PC, or for that matter, any electronic components you want to protect with a battery backup system. Before we continue, a word about what type of devices you should consider for use with a UPS. Generally speaking, the UPS devices we're talking about are designed for electronic devices with only small non-inductive motors. This means devices like computers, stereos, TVs, and most electronic peripherals are all candidates for being connected to a UPS. Devices with large inductive motors require specialized UPS devices and different sizing methods than outlined in this article. If you're not sure if your device should be connected to a UPS, check with the UPS manufacturer. What Can a UPS Do for You? A UPS for your computer equipment provides two primary services. It can condition the AC voltage, eliminating or at least vastly reducing surges and noise that can disrupt or damage your computer system. A UPS is also capable of providing your computer system with temporary power when the electrical service to your home or office goes out. In order for a UPS to do its job, it must be properly sized to deliver sufficient power to the devices you have connected. Sizing includes the minimum amount of power needed to run your devices, as well as the length of time you wish to have the UPS battery provide backup power. In order to size a UPS, you need to know the amount of power used by all the devices connected, as well as the amount of time you would like the UPS to be able to provide power to the devices in the event of a power outage. The more devices connected, and the longer you wish to have them be able to run in a power outage, the larger the UPS you need. Sizing a UPS for use with your computer setup can be a bit intimidating, especially if you've been checking out UPS manufacturers' websites. Many provide various tools, tables, and worksheets to try to help you pick the properly sized unit for your computer. While it's awesome that they're trying to help match you to the right unit, they tend to overlook and oversimplify the process. One of the important values you need to know is the amount of wattage the UPS system will need to deliver. Wattage is a measure or power and is defined as one joule per second. It is an SI (Système International) unit of measure that can be applied to measure power. Since we're working strictly with electrical energy, we can refine the meaning of wattage to be a measure of electrical power equal to the voltage (V) multiplied by the current (I) in a circuit (W = V x I). The circuit in our case is the devices you're connecting to the UPS: your computer, monitor, and any peripherals. Almost all electrical devices will have voltage, amperes, and/or wattage listed on a label affixed to them. To find the total, you can simply add together the wattage value listed for each device. (If no wattage is listed, multiply the voltage x the amperage.) This will produce a value that should be the maximum wattage all of the devices are likely to produce. The problem with using this number is that it doesn't indicate the actual wattage that is routinely used by your computer system; instead, it's the highest value you're likely to see, such as when everything first turns on, or if you have your computer maxed out with all available add-ons and performing complex tasks that need the most amount of power. If you have access to a portable wattmeter, such as the popular Kill a Watt meter, you can just plug in your computer and peripherals and directly measure the wattage used. You can use either the maximum wattage value or the average wattage value you gathered using a wattmeter. Each has its advantages. The maximum wattage value will ensure that a selected UPS will be able to power your computer and peripherals without any concerns, and since your computer isn't likely to actually be running at peak power when the UPS is needed, the extra unused power will be used by the UPS to allow your computer to run slightly longer off the battery. Using the average wattage value allows you to select a UPS that's sized more accurately for your needs, helping to keep costs slightly lower than if you used the maximum wattage value. Now that you know the wattage rating of your computer and peripherals, you might think you could go ahead and select a UPS. If you've already been looking at UPS devices, you've probably noticed that UPS manufacturers don’t use wattage (at least not directly) in sizing their UPS offerings. Instead, they use a VA (Volt-Ampere) rating. The VA rating is a measure of the apparent power in an AC (Alternating Current) circuit. Since your computer and peripherals make use of AC to run them, the VA rating is the more appropriate way to measure actual power consumed. As an example, if your computer system plus the peripherals had a total wattage of 800, then the minimum VA rating you would be looking for in a UPS would be 1,280 (800 watts multiplied by 1.6). You would round this up to the next standard UPS VA rating available, most likely 1,500 VA. The minimum VA rating only signifies that the UPS is able to supply the needed power to your computer system; it doesn't indicate the runtime, or how long the UPS will be capable of powering your system in a power failure. So far, you've figured out how much power in wattage your computer system uses. You've also converted the wattage measurement to find the minimum VA rating needed for a UPS to run your computer system. Now it's time to discern the amount of UPS runtime you'll need. When we speak of UPS runtime, we're concerned with how long the UPS unit will be able to power your computer system at the expected wattage level during a power outage. To calculate runtime, you need to know the minimum VA rating, the battery voltage, the amp-hour rating of the batteries, and the efficiency of the UPS. Unfortunately, the needed values are rarely available from the manufacturer, though they will sometimes appear inside the UPS manual or technical specifications. The hardest value to uncover is efficiency. If you can’t find this value, you can substitute .9 (90 percent) as a reasonable (and slightly conservative) value for a modern UPS. If you can't find all of the parameters needed to perform the runtime calculation, you can try visiting the UPS manufacturer's site and looking for a runtime/load graph or a UPS selector that lets you enter the wattage or VA rating values you collected. Using either the runtime equation above or the manufacturer's runtime calculator, you can ascertain the runtime a specific UPS model will be able to provide with your computer system. 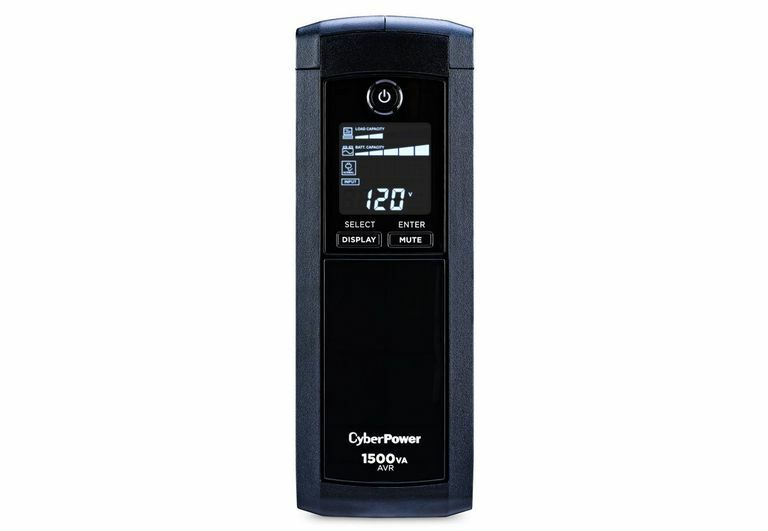 As an example, a CyberPower CP1500AVRLCD, which we use for our Macs and peripherals, uses a 12-volt battery rated at 9 Amp hours with 90 percent efficiency. It can provide backup power for 4.5 minutes to a computer system drawing 1,280 VA.
That may not sound like much, but 4.5 minutes is long enough for you to save any data and perform a graceful shutdown. If you want a longer runtime, you'll need to pick a UPS with better efficiency, a longer lasting battery, higher voltage batteries, or all of the above. Actually, choosing a UPS with a higher VA rating in and of itself does nothing to increase runtime, though most UPS manufacturers will include larger batteries in UPS models with larger VA ratings. So far, we've looked at how to size a UPS and not at any of the other features of a UPS that should be considered. One more item to consider when picking a UPS is the battery. A UPS is an investment in safeguarding your computer system. The UPS has one replaceable component: a battery that will need to be replaced from time to time. On average, a UPS battery lasts 3 to 5 years before it needs to be replaced. UPS devices generally perform periodic tests of the battery to ensure it's still able to provide the needed wattage when called upon. Many UPS devices will provide you with a warning when the battery needs to be replaced, but a few will simply stop working the next time they're called upon to provide backup power. Be sure to check the UPS manual before purchase to confirm that when the battery fails, the UPS provides a pass-through mode that lets the UPS continue to operate as a surge protector until battery replacement. And finally, as long as you're checking on the battery, you may wish to determine the replacement cost. You'll likely be changing out the battery a few times during the life of the UPS, so knowing the cost and whether batteries are readily available is a good idea before selecting a UPS.